Sky Values- The Key to Big Atmospheric Skies! One of the most important ingredients for painting big atmospheric skies is getting the values right. We know that generally speaking the sky will have the lightest values in the landscape because it is the source of light (think Carlson’s Theory of Angles- if you don’t know about that you should!). The value of a typical sunlit sky will grade from light to dark from the horizon to its zenith. But it is helpful to assign an actual value to these gradations so we can place them in proper context within the entire landscape . If you key your sky too dark, it will look leaden and lower the value of your entire painting. First, here is the Munsell value scale, running from 10 to 0, light to dark. All images can be clicked for a larger view. 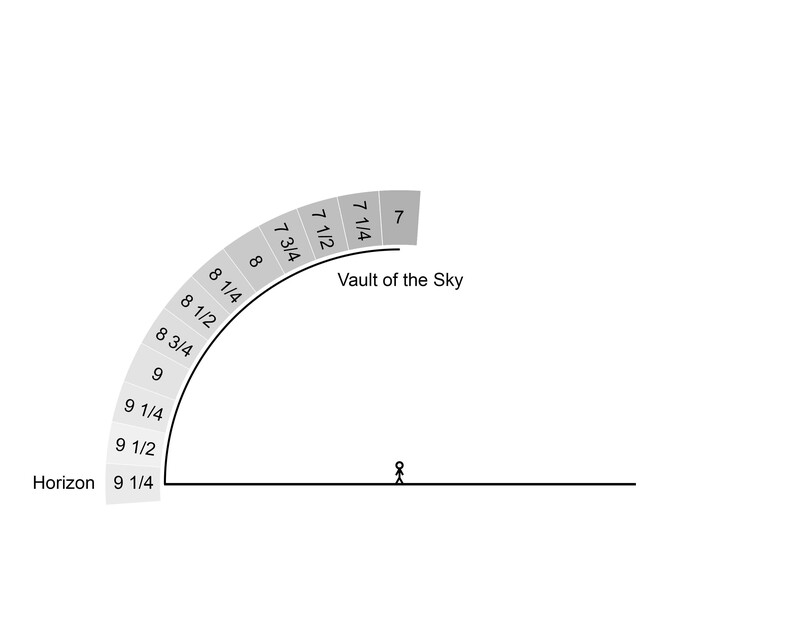 So, remembering that the sky is a vault (right?) here is what that might look like, assigning values to the sky. You will note that there is just a slightly darker value that occurs right at the horizon. Often this is not visible because objects (buildings, mountains etc) are in the way. But, when it is visible, making this value adjustment is crucial. The values in the sky also grade light to darker from the source of the light to the opposite side of the sky. So, near the sun, values will be lighter and get progressively darker farther away. Here is what that might look like. So, go outside and look up! 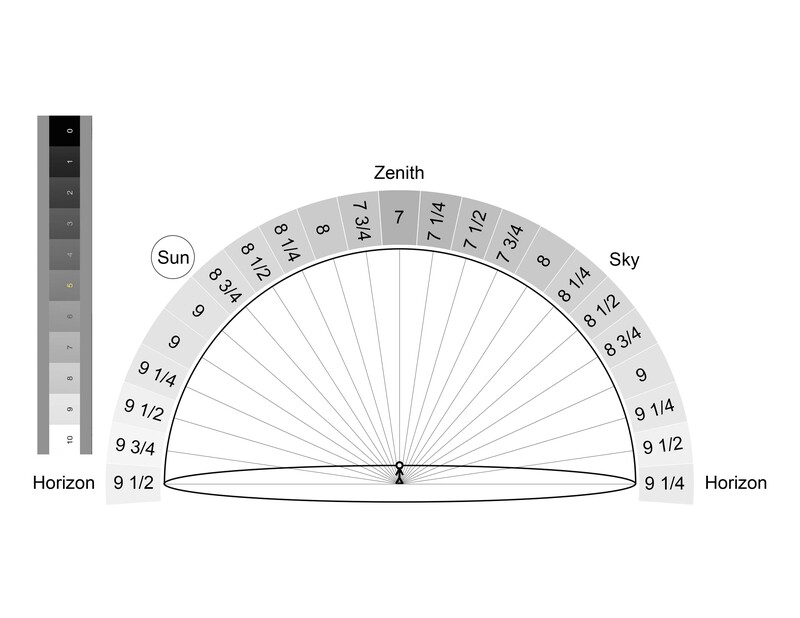 Observe these gradations and how they look in different parts of the sky. The values might be somewhat different from what is shown here depending on weather conditions. For example, on an overcast day, the values will actually be lighter than they are on a sunlit day! Often we may be painting a smaller part of the sky or a lower part of the sky than would include the whole range of gradations. But here is where some artistic license can be taken. Showing both vertical and horizontal gradations, even if not the entire range, will help make your skies look big and atmospheric.